The transhumanist conference and community convention TransVision 2010, which took place in Milan October 22 to October 24, 2010, was very intense, informative, and scientific, as well as an entertaining tour de force in contemporary transhumanist thinking, activism, science, technology, and innovation, and grand visionary dreams. Over 40 talks over the three days explored the scientific, technological, cultural, artistic and social trends that could change our world beyond recognition and may result in a Singularity in only a few decades. About 65 participants attended TransVision live in Milan, including the the dog of the Italian biologist, writer and animal right activist Roberto Marchesini. I welcomed the dog as a first non-human participant and expressed my hope that more and more non-human intelligences, including sentient artificial intelligences, will participate in future TransVisions. 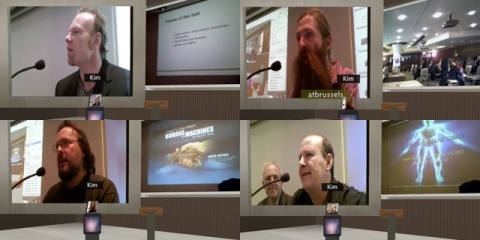 The participants in Milan were joined by about 30 remote participants from all over the world. 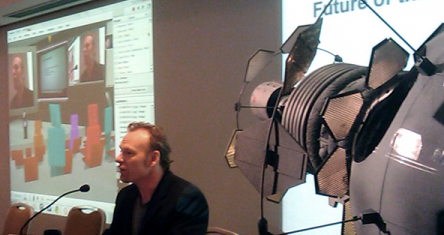 The conference was streamed interactively as a full 2-way “mixed-reality” event, with local and remote speakers and participants. Remote participants, attending via the teleXLR8 online “cultural acceleration” facility based on the Teleplace platform, were able to watch all talks in real time, and interact with speakers and other participants. Nearly all talks given at the conference were recorded by remote participants in Teleplace and are available here, and some talks will also be available in HD on the conference’s DVD and online on blip.tv. Some speakers gave their talks remotely, and the two groups of participants were effectively merged into one group, except for the last hour of the second day, when a local service outage shut down the Internet connections at the conference hotel. The brilliant talks of remote speakers Natasha Vita-More and David Styles were lost to the audience in Milan (disconnection from the Internet is catastrophic these days), but they were recorded by other remote participants. TransVision 2010 continued the trend toward “mixed-reality” events initiated by the ASIM 2010 Conference in San Francisco (satellite to the Singularity Summit 2010) and demonstrated that modern desktop telepresence technology can effectively open conference to remote participants. In my own talk on “Online conferences 2.0,” I outlined the teleXLR8 program and proposed online events as a complement or a faster and cheaper alternative to traditional meatspace conferences. Complementarity has been an important keyword at TransVision 2010. Not only between physical and online events, but also complementarity and synergy between science and art, between practitioners and philosophers, between technology and spirituality, between moderate and visionary transhumanism, and between different groups in the Italian transhumanist community. Of course, many talks were focused on science and technology: life extension, biotechnology and genetic engineering, cryonics and brain preservation, whole brain emulation and mind uploading, synthetic biology, virtual and augmented reality, artificial intelligence, nanotechnology, converging technologies, the technological Singularity, and other transhumanist technologies, either already emerging from the research labs and almost ready for operational deployment, or still in conceptual development. Aubrey de Grey, Martine Rothblatt, David Orban, Eugen Leitl, Domenico Dodaro, Randal A. Koene and other speakers showed fascinating glimpses at tomorrow’s technologies being developed today. But the conference program was designed to highlight the fact that transhumanism is not only about cool science and techno gadgets. The philosopher Max More, the founder of modern transhumanism, provided a bridge between the approaches of Aubrey de Grey and Martine Rothblatt to radical life extension, based respectively on continuity of biological life and cybernetic immortality as uploads, by analyzing the elusive concept of self. The conference hall featured the Terasem O’Neill Island One Space Habitat, a Bernal sphere model built by Simon Deering for Martine Rothblatt’s Terasem Movement and presented by the artist and transhumanist activist known as “K” as a powerful symbolic statement of support for space, where we should go back to stay. K presented also a rather dark view of our short-term future on this planet, which adds urgency to the dream of space colonization. K does not share the radical optimism of some transhumanists. Neither does Mike Treder, who warned the audience against the perils of naive optimism and a “flying cars and cities on the moon” future that never seems to materialize. Miriam Ji Sun’s talk was also focused on the “here-and now.” But Anders Sandberg jumped forward to the thermodynamics of advanced civilizations out there in the universe and, hopefully, our own civilization in a future age, and David Pearce outlined possible developments for post-Darwinian life. It is evident that in today’s transhumanist community, there is a complementarity between moderate quasi-mainstream approaches focused on the “here-and now” and visionary approaches focused on the far future and informed by good science fiction. We definitely will not stop reading good science fiction like the works of Francesco Verso, one of the most interesting emergent Italian SF authors and the winner of a recent, prestigious literary prize. Other artists also participated in the conference, which finished with the notes of the beautiful music from the stars composed, with some aid from the universe itself, by the noted astrophysicist and musician Fiorella Terenzi. I have already mentioned some current issues and debates in the transhumanist culture, and now I must come to the elephant in the living room: the growing awareness that transhumanism has a spiritual component, which must not be ignored or swept under the carpet. We showed excerpts of a video presentation by Ben Goertzel on his Cosmist Manifesto, which I and others consider a seminal work. In his remote presentation, Robert Geraci, a professor of religious studies and the author of Apocalyptic AI: Visions of Heaven in Robotics, Artificial Intelligence and Virtual Reality, has said loud and clear that transhumanism is a religion, unconventional but a religion nonetheless, it has always been a religion, and it can win hearts and minds as a religion. The French author Remi Sussan also analyzed religion from the point of view of a hacker and a designer of future religions, and Dan Massey, a true Renaissance scholar, gave a thoughtful and energizing talk on transhumanist spirituality, sexual freedom, and our future. We will be back for TransVision 2011 under the banner of “more”: more speakers, more participants, more diversity, more science, more technology, more literature, more art, more spirituality, more debates, more synergy, and of course, our friends Max More and Natasha Vita-More, whose name can be interpreted as More Life. Campa made it clear that Italian Futurism should be considered as a precursor of Transhumanism, and that associating it with fascism is philosophically and historically very inaccurate. The Italian philosopher Emanuele Ratti presented his work on Nietzsche as another transhumanist precursor. Other new philosophies are being developed by the planetary collaboration that is the Internet. One, the Polytopia project, was the subject of a unscheduled talk by Giulia Borghini and her Space Collective crowd, which was one of the most interesting talks. The lower-than-expected number of participants also resulted from a boycott (or at least lack of support) by some Italian transhumanist groups. In Italy, there are two transhumanist associations: the Italian Transhumanist Association (AIT) and a splinter Transhumanist Network. Some members of the Network like to accuse AIT members, and in particular the brilliant and eloquent Stefano Vaj, of fascist leanings. This allegation has been disproved many times, also by well-known left-wing transhumanists, but it is annoyingly still proposed by some members of the Network, which has created a gap between the two groups. But the presence of three exponents of the Network at TransVision 2010, Giuseppe Vatinno who presented his new book, and the young polymaths Marta Rossi and Jacopo Tagliabue, was interpreted by Vatinno and myself as the possible beginning of more friendly relations between the two groups.